According to the Public Health Agency of Canada, three in five Canadians over the age of 20 live with a chronic illness and four in five are at risk. In Canada, 67 per cent of all deaths each year are caused by four major chronic conditions: cancer, diabetes, cardiovascular and chronic respiratory disease. Based at UBC Okanagan, the newly-introduced Chronic Disease Prevention Program (CDPP) will harness the strengths of researchers from both Okanagan and Vancouver campuses and Interior Health (IH) to support new discoveries and knowledge translation in this ever-pressing domain. Kathleen Martin Ginis, a professor with UBC Faculty of Medicine and UBC Okanagan Faculty of Health and Social Development, is the founding CDPP director. “Our end goal is to foster research excellence that’s responsive to the healthcare needs of our region’s communities both urban and rural, and advances the international research field,” says Martin Ginis. The first step, she explains, is to recruit an interdisciplinary team of clinical and implementation scientists and community health researchers who will work under the CDPP umbrella. Martin Ginis also plans to establish new partnerships with health professionals and community-health organizations throughout the IH region. “Our collective efforts will focus on new investigations in the areas of physical activity and nutrition/healthy eating, and diabetes, cardiovascular disease, neurotrauma and neurodegenerative diseases, and implementing those research findings into the community,” she adds. To bolster the program’s development, Martin Ginis will serve as the inaugural Reichwald Family UBC Southern Medical Program Chair in Preventive Medicine. Established by the Reichwald family, the endowed chair will accelerate the development of an academic research program that advances our understanding of chronic disease and establishes new community-based prevention programs. UBC Professor Kathleen Martin Ginis. Kathleen Martin Ginis is a professor with UBC Faculty of Medicine Department of Medicine, Division of Physical Medicine and Rehabilitation and the UBC Okanagan Faculty of Health and Social Development, School of Health and Exercise Sciences. 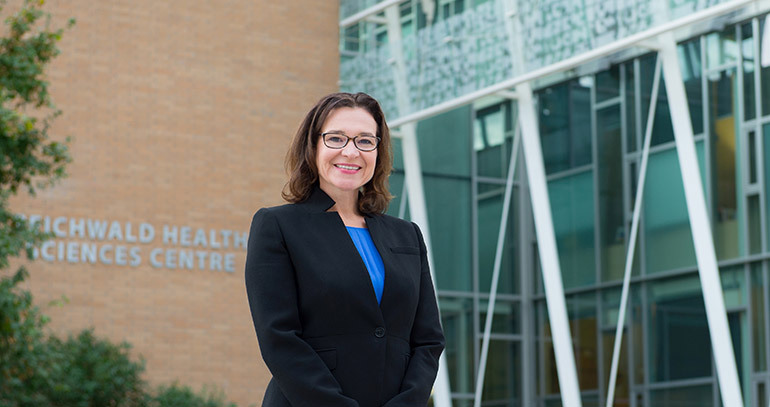 She is the founding director of the Southern Medical Program’s Chronic Disease Prevention Program and inaugural Reichwald Family UBC Southern Medical Program Chair in Preventive Medicine. Martin Ginis is the founding director of Spinal Cord Injury (SCI) Action Canada, a national alliance of community-based organizations and university-based researchers working together to advance physical activity participation in people with spinal cord injury. She is also the principal investigator of the Canadian Disability Participation Project and an ICORD (International Collaboration on Repair Discoveries) principal investigator. Her research studies are some of the first to outline the psychosocial benefits and strategies for increasing physical activity in adults with spinal cord injury.